So how many of you waded through your recycling bins to find a plastic bottle for my last craft? This time there is much more adult involvement and a little bit more effort too. 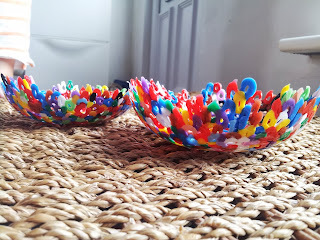 We successfully made these special little bowls after seeing lots of similar posts on Pinterest. Essentially you'll need Hama (or other similar) beads. You know the kind that you put on a pegged board and then iron over? Yep those. You can buy these relatively inexpensively especially if you don't buy a set, but a refill bag/tub of just beads. Preheat your oven to about 180 degrees. Give each child a small bowl - I have little Pyrex pudding basins that we used. Then ask them to either spray oil or brush a light coating of oil around the inside of the bowls. The children can now put a couple of handfuls of beads in each bowl. Roll the bowls around so there is a single layer of beads sticking to the oil. Children can decide whether to have a flat rim, or make it a bit more interesting. 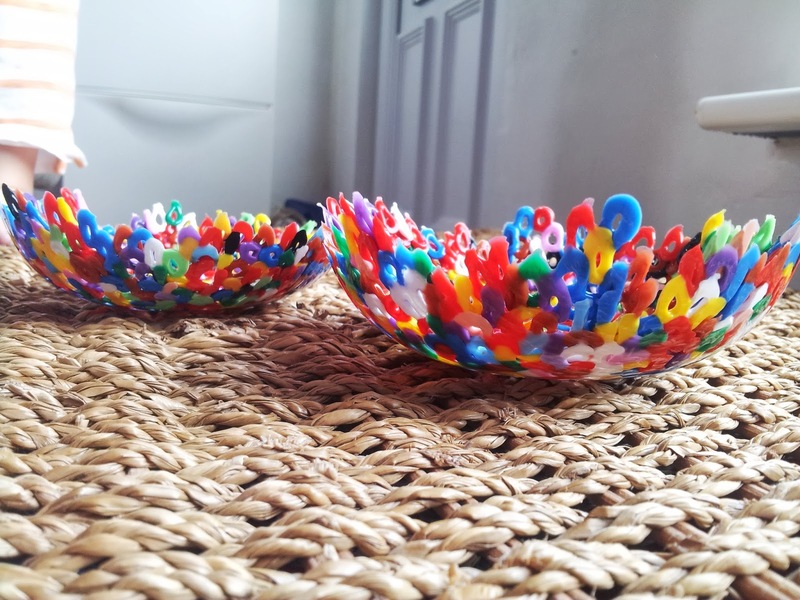 Adults should put the bowls into the oven, and then keep checking them to see when the beads have started to melt. Ours took about 15-20 minutes, from a non-preheated oven. Remove using oven gloves, and leave to cool for about 30 minutes. Give the bowls a quick wash in soapy water to remove the oil. And there you have some cute trinket bowls. 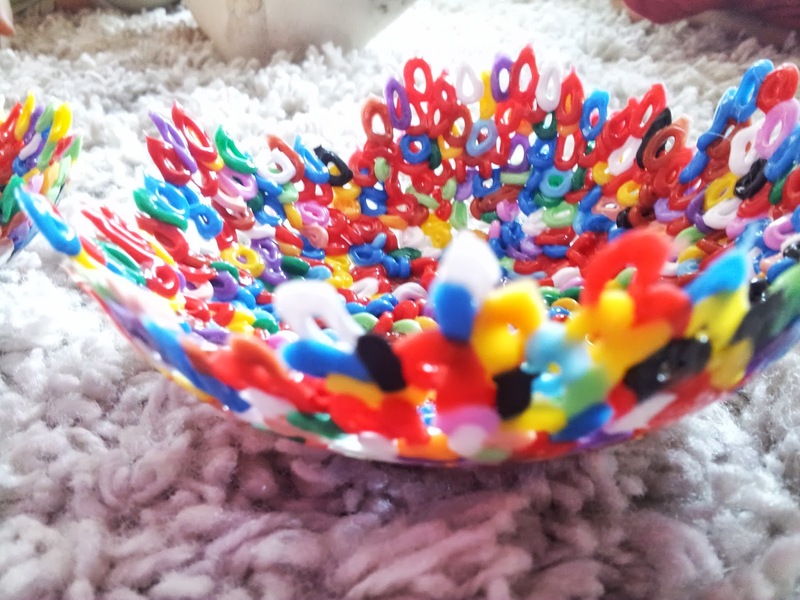 Obviously you could be all clever and try to make patterns or pictures mosaic style, you could limit the number of colours you use, or try making different size bowls. I've even seen these made as luminaries - turn upside down and place a battery operated tealight beneath. Mini kept running to look through the oven door to see if they'd melted yet. He was excited to see how they turned out. Dollop was more interested in making sure all the gaps were filled, and she took her time to make sure her bowl was how she wanted it. Great fun, and good for rainy days, or even a quick break from hot sun. Ha ha. It was a nice way to spend 20minutes, and the kids are really pleased with their results. 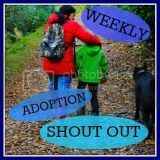 Mini even showed the social worker earlier this week...he was very proud of it! Oooh we are going to have to try this! Inspired! Thanks for popping over :-) We love them. Project Linus - can you help?